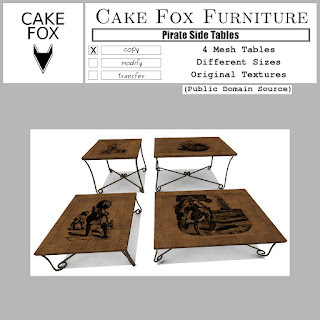 Cake Fox is taking part in The Renaissance Faire Sept. 1-30 2015. 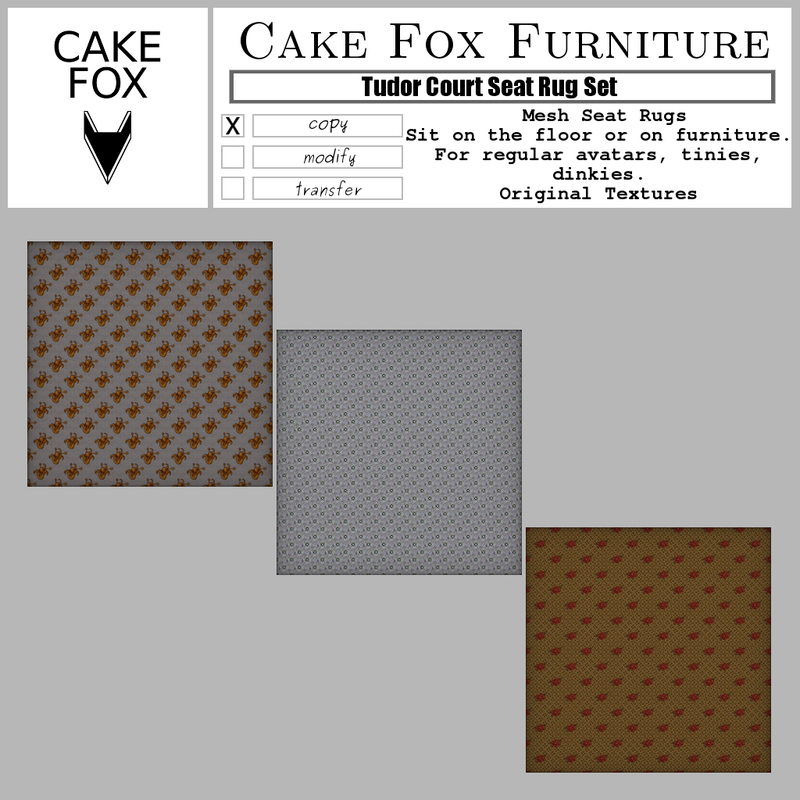 Our booth is in the tiny area, right next to Liam Metaluna's, where you so often find Cake Fox during the Mieville events. The tiny area is close to the main landing point, by the event stage. Most of the stuff works for everyone, though so make sure to check these booths out even if you are not a tiny. As always, during the Renaissance Faire there is also the gridwide Renaissance hunt. 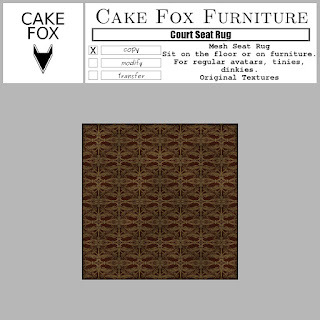 Cake Fox is participating with Court Seat Rug, a gift that works for most avatar types, because in addition to having poses for regular avatars, dinkies and tinies, it also has an adjust option. It is just 1Li original mesh, and made with original texture. 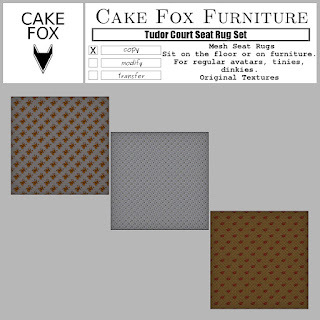 I made a for sale version of the seat rug called Tudor court seat rug set. 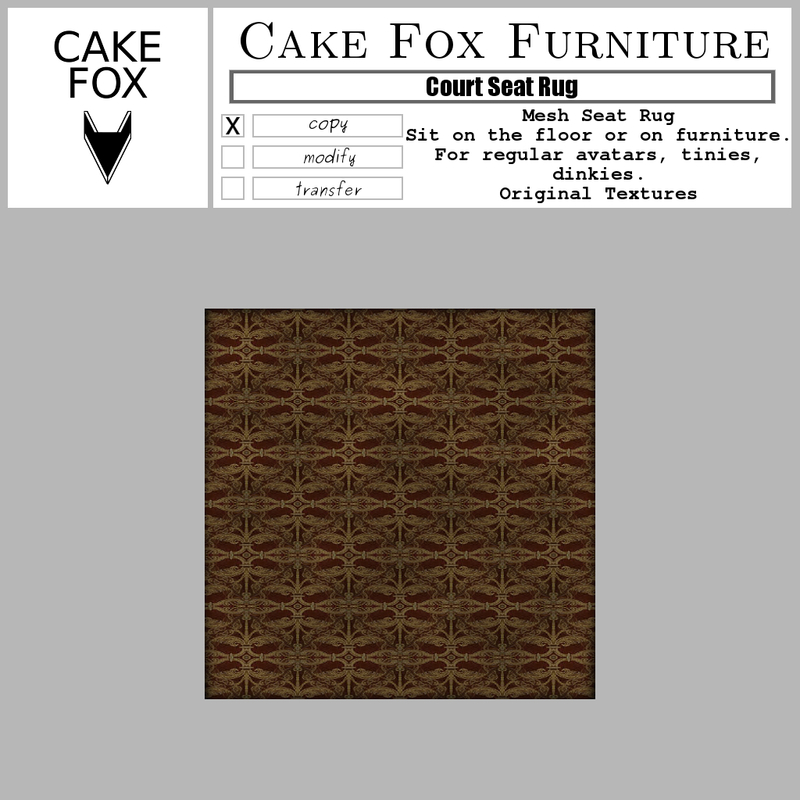 It has the same seating options as the hunt gift does. 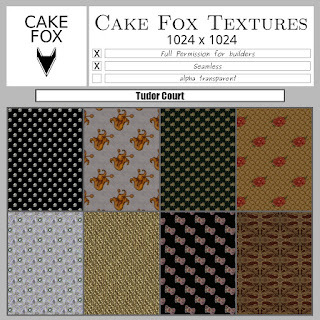 With 3 different textures. There is also the event hunt for Renaissance faire merchants only. Here is the fancy keyhole table that I made for the faire hunt. 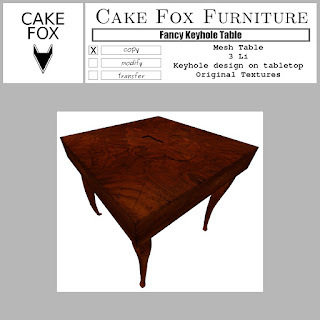 The point of the keyhole is that it shows better in some angles than others but I hope you can tell where it is from the vendor image. This walnut chest of drawers is a new furniture piece I made for the Renaissance faire. 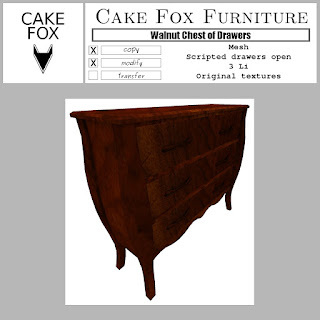 The drawers open but if you want to turn the chest around, you may need to edit the scripts inside them, because of how mesh scripting works, apologies for that. Im me if you have any questions. 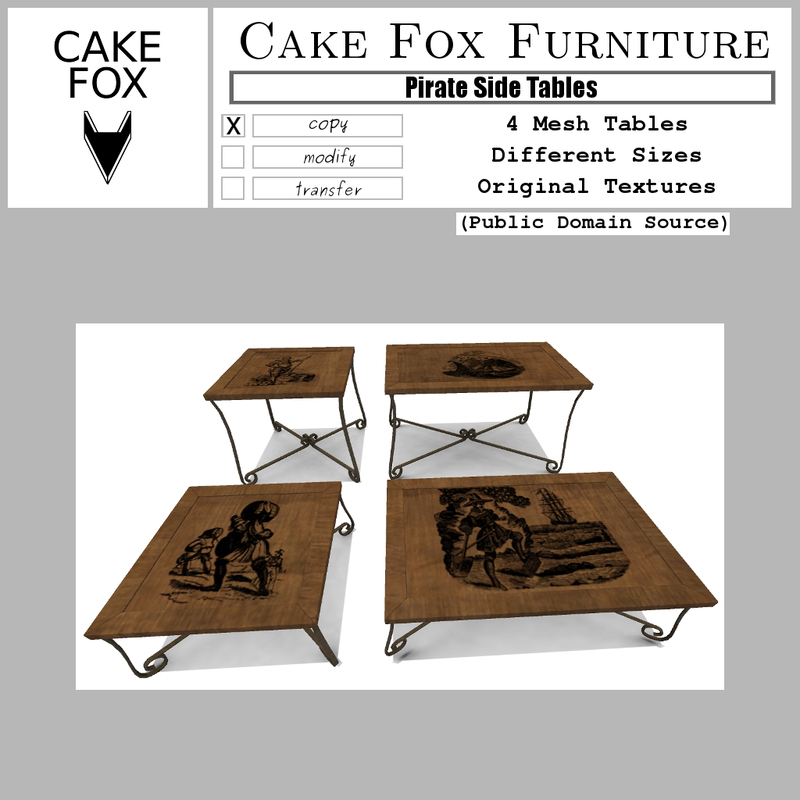 The pirate side tables were originally intended for the pirate theme tinies were having in August. But I thought they fit well with the Renaissance theme, so added them to the mix. The drawings are historic ones from public domain sources. And finally a new fullperm release for builders. TOS applies, so do not give these away or sell them as is. They can be used in products that you then sell. Read the TOS inside the box. 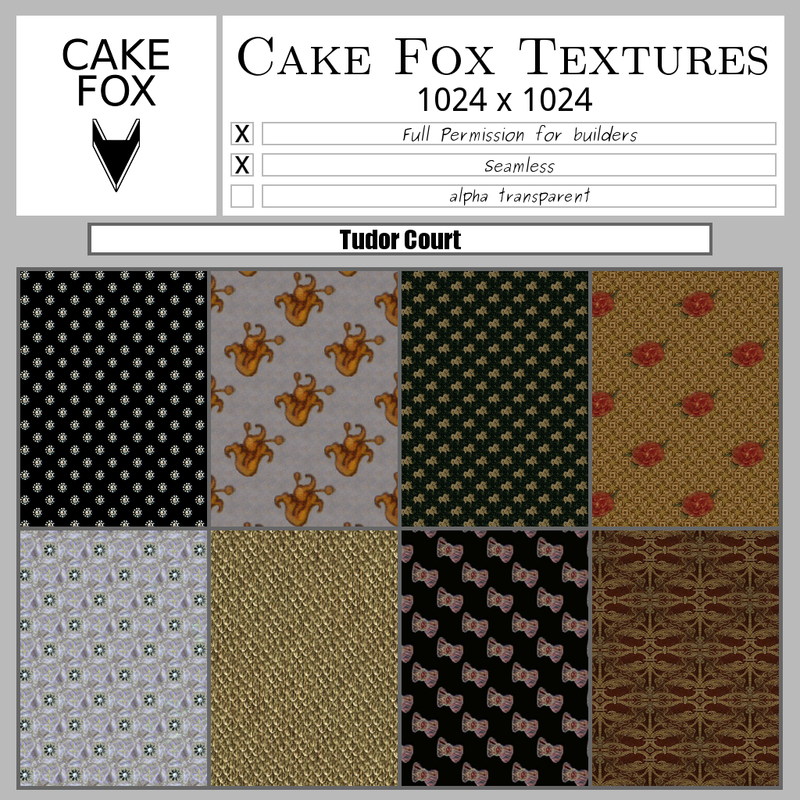 These eight seamless fullperm textures were made using real Tudor era motifs, but they are all original designs.